Florida Manatee (Trichechus manatus latirostris). Also known as Sea Cow. Crystal River, Florida, United States of America. Classified Endangered Species on the IUCN Red list. Florida Manatee (Trichechus manatus latirostris) -showing paddle-like tail. Also known as Sea Cow. Crystal River, Florida, United States of America. Classified Endangered Species on the IUCN Red list. Florida Manatees (Trichechus manatus latirostris) gathered around the warm-water outflow of a power plant in Riviera Beach, Florida during a cold front. Also known as Sea Cows. Florida, USA. Classified Endangered Species on the IUCN Red list. Florida Manatee (Trichechus manatus latirostris). Also known as Sea Cow. Crystal River Florida, USA. Classified Endangered Species on the IUCN Red list. Captive Florida Manatee (Trichechus manatus latirostrus) in Homosassa Springs State Park in northwestern Florida, USA. Classified Endangered Species on the IUCN Red list. Snorkeler and Florida Manatee in the Three Sisters Spring, rystal River, Florida, USA. Three Sisters is a refuge for manatees during winter as the endangered sea mammals shelter in the 72 F water gushing from the ground. Florida Manatee ((Trichechus manatus latirostris) in Crystal River, Florida, USA, with tail lacerated by boat propeller. Sign reminding boaters in Crystal River, Florida, USA, of the presence of manatees and the need to obey local boating laws. Aerial photograph of Florida Manatees ((Trichechus manatus latirostris) in the Three Sisters Spring, Crystal River, northwest Florida, USA. The roped-off area is a refuge for the manatees where people are not allowed to enter. Aerial photograph of Crystal River in northwestern Florida. This section of the state is one of the last remaining wildernesses in the region and is the winter home of the endangered Florida manatee (Trichechus manatus latirostrus). Florida Manatee (Trichechus manatus latirostris). Also known as Sea Cow. Classified as Endangered Species on the IUCN Red list. Photographed in Three Sisters Spring in Crystal River, Florida, USA. Florida Manatees (Trichechus manatus latirostris), gathered around the warm-water outflow of a power plant in Riviera Beach, Florida, USA, during a cold front. Also known as Sea Cows. Classified as Endangered Species on the IUCN Red list. Florida Manatee (Trichechus manatus latirostris). Also known as Sea Cow. Crystal River Florida, USA. Classified Endangered Species on the IUCN Red list. 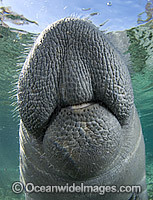 The Florida Manatee is a subspecies of the West Indian Manatee.